Akira Kurosawa’s 1955 meditation on the fear of imminent nuclear war flopped at the box office, was released internationally only years later, and remains one of his least-known films. It was sandwiched chronologically between Seven Samurai and Throne of Blood, both great triumphs. I Live in Fear also stars Toshiro Mifune, but this time as an aging industrialist (Kiichi Nakajima) rather than as a jidaigeki samurai. Still, Mifune remains Mifune: intense, emotional, and constantly in motion. We never see Nakajima looking at the camera. His restlessness is a physical analog to his psychic turmoil. Nakajima’s turmoil comes from two sources, and there are really two films in one here. The overt subject of the film and source of anxiety is the threat of nuclear war. A decade before 1955, of course, the United States had dropped nuclear bombs on Hiroshima and Nagasaki, and the fear of nuclear war was more real and its potential consequences more tangible in Japan than anywhere else. The film begins just after Nakajima’s wife has petitioned to have him declared mentally incompetent because he “harbored delusional fears about atomic and hydrogen bombs and subsequent radioactivity” and put in motion plans to move his entire family to Brazil, which he believed to be the only safe refuge from fallout in the event of nuclear war. Everyone is afraid of nuclear war, it turns out, but remain calm because they can’t do anything about it. In between domestic scenes Kurosawa shows us takes of normal urban life, of people going about their lives as if there is no looming threat. The question of who is being irrational, Nakajima or everyone else, is something Kurosawa never really answers. 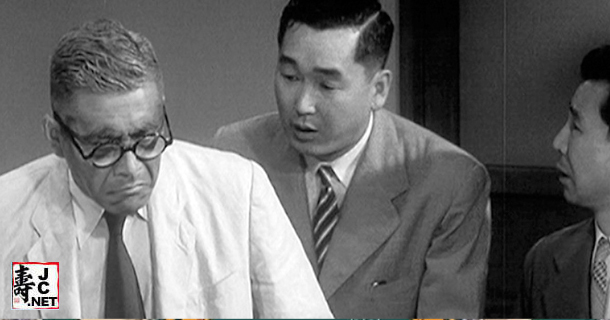 We watch through the eyes of Dr. Harada, a court-appointed mediator played by another Kurosawa favorite, Takashi Shimura. Nakajima’s “family” turns out to be complicated – he wants his illegitimate son from a woman who has passed away, two current mistresses and illegitimate child by each of them, as well as his legal wife and their three children and spouses all to come to Brazil. Ultimately the court declares him incompetent not because they think his anxiety irrational, but because he proposes to sell his property and force his family to move to Brazil or be left destitute. 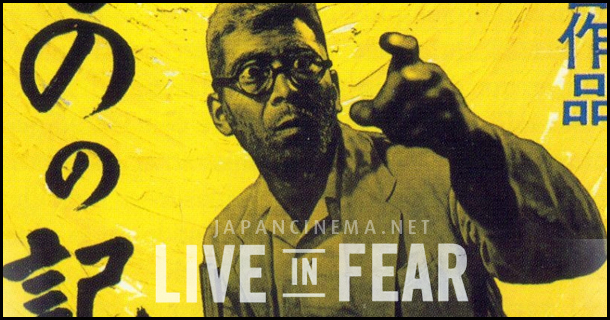 The second film in I Live in Fear that Kurosawa gives us is about the fate of patriarchy in modern Japanese society. Nakajima’s seething anger comes from the unprecedented challenge to his authority by his children. It becomes clear that what he fears most is powerlessness, whether from the court’s actions or from his inability to do anything to assuage his fear of H-bombs. The disintegration of Nakajima’s authority over his family is parallel to the potential destruction of the world. In one scene the sounds of fighter jets screeching overhead induce an imagined nuclear flash and a panic attack. He believes that distant bomb tests even control the weather. Nakajima collapses from exhaustion, but recovers enough to deliberately burn down his foundry to force his family to move to Brazil. He is arrested for arson, has a total mental breakdown from his double emasculation, and ends the film insane and institutionalized. Beyond the twin plots, I Live in Fear is most enjoyable because of the acting. Kurosawa gives his veteran cast time and freedom to communicate internal feelings with facial expressions and body language rather than dialogue. The film is about gestures, about how people communicate wordlessly. There are long takes with no dialogue or music. Kurosawa heightens this in key scenes by placing the camera low and directly behind the main speaker, so that we look at his audience watching him. It creates a suspense and tension more tangible for an audience today than the more extreme fear of nuclear war or social collapse that haunts Nakajima. Posted on October 27, 2013 by bilcummings. This entry was tagged 1950s, atomic, cinema, fear, h-bomb, japan, Kurosawa, Mifune, nuclear, patriarchy. Bookmark the permalink.